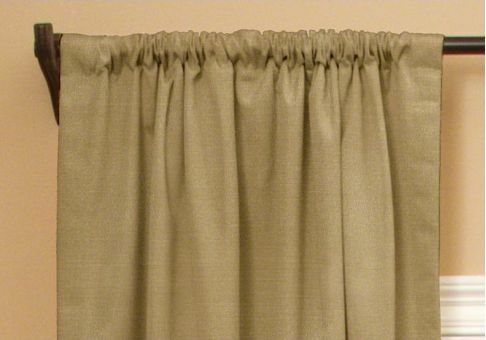 Carefully follow the instructions below to get an accurate measurement for your custom drapes. During the ordering process, please confirm your order specs before checkout. Adding 4" - 6" on either side of your opening maximizes natural light and provides the best finished look. We have made allowances for fullness, returns and overlaps to ensure a beautiful finished look. If ordering panels that do not close and are intended for decorative purposes, consider ordering drapery with less coverage. 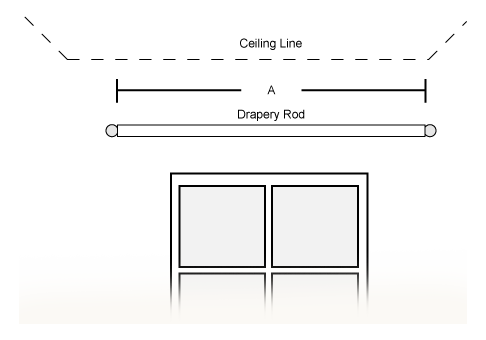 If you need the panels to completely clear the entire window and frame when opened (such as with French Door applications), please contact us to help you calculate your drapery width. Due to how the drapes hang on the drapery rod, it is important to measure length using the style measuring guides below. Drapery hardware is typically hung 4" above an opening for standard installation, or as close to the ceiling as possible. Doing this will provide the illusion of a larger window. 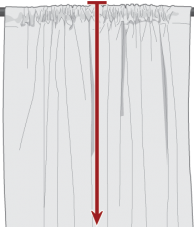 Measure from the top of the drapery rod to the floor (as shown). The diameter of your drapery rod will affect the length of your panel. 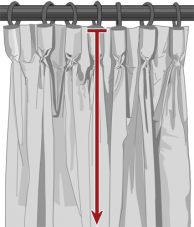 Tabs on Tab Top Drapes are 4" long and will not accommodate a rod larger than 2" in diameter. 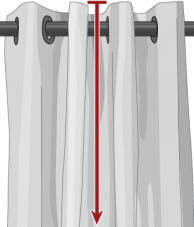 Measure from 1 inch above the drapery rod to the floor (as shown). 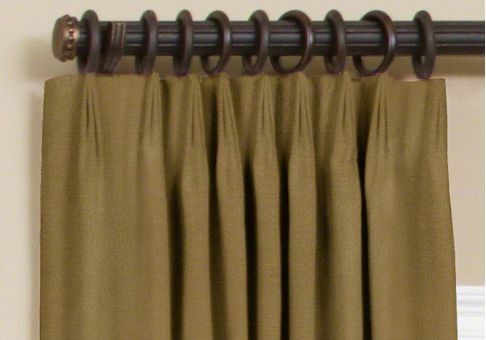 Take into consideration that there is an additional 1" of panel above the rod since the grommets are set 1" down from the top of the drapery panel. Be sure that your drapery rod is mounted high enough that the bottom of the grommet is higher than the top of the window molding. The Rod Pocket style is created when a pocket is sewn at the top of your fabric creating an opening through which to slide your rod. 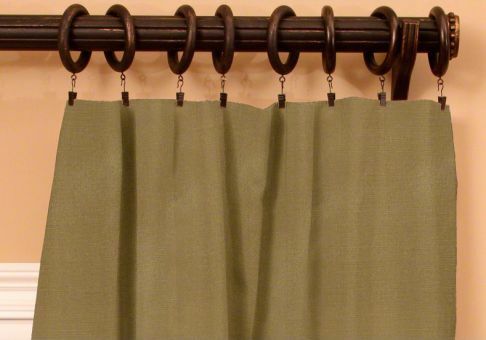 The rod pocket is included in the length of your drapes. 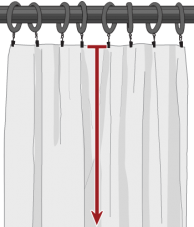 Rod Pocket Size & Take-Up Measurement: When ordering Custom Rod Pocket Drapes, you will also choose the size of your rod pocket. There is some rod take-up when the material is gathered onto the pole. 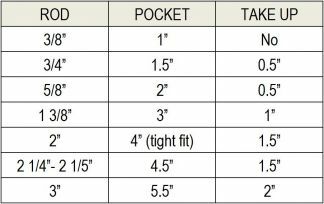 Determine your drapery rod diameter, and refer to the chart below to determine the amount of additional take-up that is required. 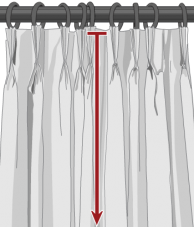 Add the take-up measurement to your Drapery Length when ordering. 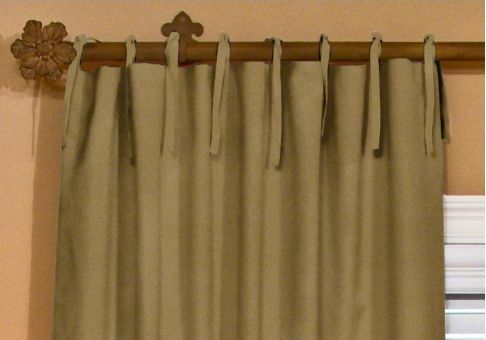 Measure approximately 1" from the bottom of the drapery rod to the floor (as shown). Ties are 12"L x ½"W and accommodate rods up to 2" in diameter. 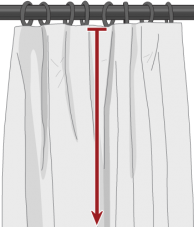 Tie length is not included in finished Drapery Length measurement. Measure from the bottom of your drapery rings to the floor (as shown). 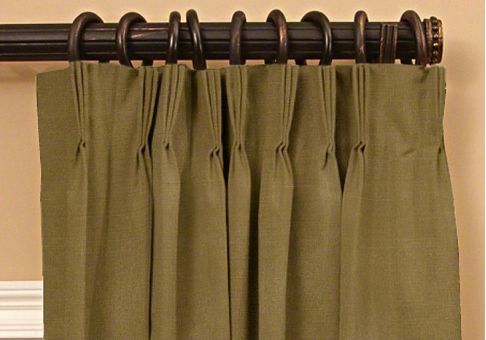 Flat Drapes come with drapery hooks set in the back of the panel and are ready for installation. Once the panels arrive, simply place the hooks into the eyes on the bottom of your drapery rings. 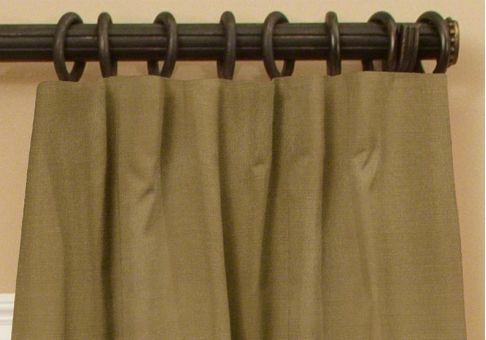 This style of drapes requires alligator clips (not included) to secure the panel in place. Measure from the clip at the bottom of your drapery rings to the floor (as shown) for the length measurement. 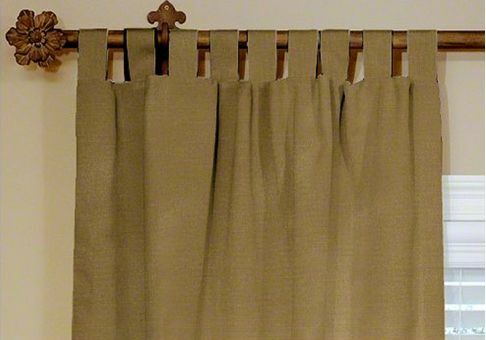 Clip Top Drapes are easy to install. 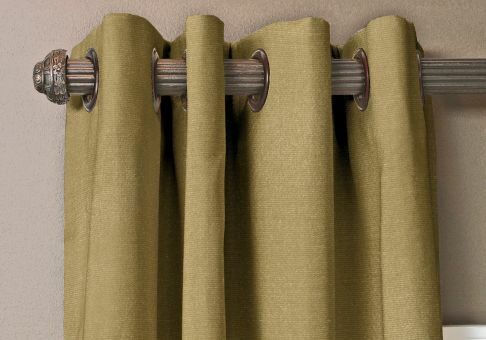 Simply use alligator clips (not included) to attach the drapes to your drapery rings. 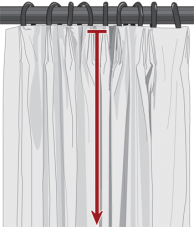 Typically, French Pleat Drapes are used with drapery rings or a decorative traverse rod. This style comes standard with drapery hooks set in the back of the panel for installation purposes. Decorative Traverse Rod with Rings: Measure from the bottom of the rings to the floor. Pleats will hook into the rings and the decorative drapery rod will be seen. If you are using a different style of drapery rod, please contact us for measuring instructions. 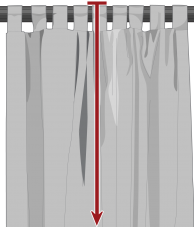 Typically, Euro Pleat Drapes are used with drapery rings or a decorative traverse rod. This style comes standard with drapery hooks set in the back of the panel for installation purposes. 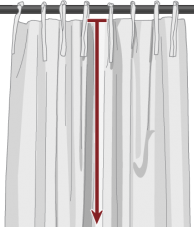 Typically, Goblet Pleat Drapes are used with drapery rings or a decorative traverse rod. 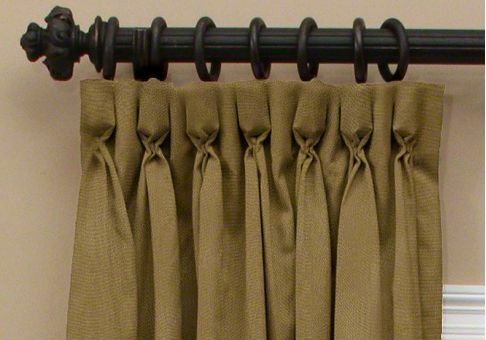 This style comes standard with drapery hooks set in the back of the panel for installation purposes.